For millions of people around the world, cancer is a source of great fear, and when most are diagnosed with it, they regard it as a veritable death sentence, sometimes openly, but oftentimes in private. And then there are doctors, of course, who often do regard it as a death sentence out in the open (which obviously doesn’t do a whole lot to raise the fragile spirits of their ailing patients). Canadian native, actor and Tommy Chong of ‘Cheech and Chong’ fame saw his own cancer diagnosis as something completely different, however, as many people who are knowledgeable in natural medicine do. Chong kept calm and went the natural route, saw the diagnosis as a wake up call to get his diet and stress under control, and began taking his health seriously again. In May 2013, Chong had a message for the world: he proclaimed himself to be cancer-free thanks to a disciplined diet under the guidance of a naturopath, and the use of hemp (hash) oil as a supplement. As Chong noted in the blog post on his website, he was originally told that a high frequency treatment that could only be done in Mexico for $25,000 was his best option to treat his Stage One, slow-developing prostate cancer, but he decided to look for his own alternatives. Through a nephew in Vancouver, he met with a Dr. McKinnon in Victoria, British Columbia. 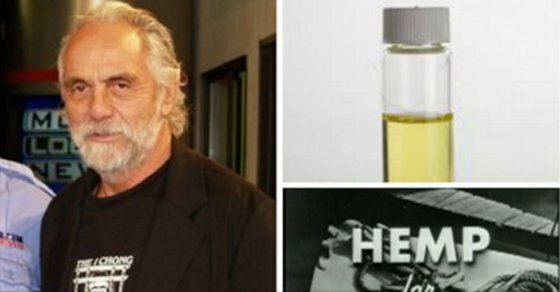 Ever the advocate for both free marijuana and hemp usage and their benefits, Chong also utilized hemp (hash) oil as part of his diet, much as author and healer Rick Simpson recommends in his ‘Phoenix Tears’ protocol. Also as part of his program, Chong attended a session with Adam Dreamhealer, the “world-renowned” energy healer. Dreamhealer’s sessions focus on group healing, visualization exercises and other complementary techniques that help put the body into a prime mental state for healing. This is one aspect of healing that most people ignore, but Chong was smart to incorporate into his own natural healing protocol, even if only for one session. There are many ways to heal emotionally and to remove stress from our lives, but many sick people unfortunately are not given the opportunity to embrace this sort of lifestyle or methodology. “So the magic plant does cure cancer with the right diet and supplements,” Chong boasted on his twitter account. “I feel the best I feel in years,” he said, noting that he still had another blood test, MRI, etc. to go in for, in order to confirm. While Chong hasn’t updated his status since then, it seems as though he is doing well, and his story mimics those of many other thousands of cancer survivors who chose not to use chemotherapy, which has actually been shown to make cancer more malignant according to recent research. Unfortunately, a lack of research surrounding natural cancer treatments continues to hold back the movement, and negatively affect the health of millions. At the very least, hospitals should do a better job of working with the natural health movement and start taking diet, emotional health and supplements seriously so that patients have a better chance of survival. Speaking of the emotional side of things, it’s one that’s often grossly overlooked when it comes to cancer. Stress combined with a poor diet, especially one high in refined sugar, is oftentimes a trigger for cancerous cell growths (many people believe that cancer growth and release is a natural cycle within the body, but sometimes the growth can get out of control leading to more serious consequences). Most people I’ve personally known to have treated their cancer naturally also have invested their time in healing not just their physical bodies but also their emotional states, addressing underlying stressors, finding a way to take time off of work and relax, or to address other issues that have been holding them back from becoming optimistic again, and finding their purpose and value in life. Natural cancer healing is indeed possible, but what many people don’t realize is just how important the biology of belief and a person’s mindset factors into the equation. Many naturopathic healers still lack in experience in this area as well, so the quality of doctor varies wildly from one place to the next. That’s why it’s important to seek out the best and most experienced naturopathic doctors who have a track record. At any rate, Chong’s experience is just another piece of evidence that we really need to start taking natural cancer protocols seriously, and also that the value of hemp as natural medicine (not to mention green industry material) cannot be understated.